What a week. My heart breaks for the parents and families of those who have died. I really wasn't sure what to write about. Everything pales in comparison to what has happened and so many people are hurting. I have no words to add so I thought I would keep it practical. Last week we got a new dishwasher. Our old one didn't wash well and the entire top rack was broken so it would sometimes fall while I was loading it. Not a good thing when it was full of glasses. I mean, I got to practice my sweet ninja moves and all, but still. So we trashed our really old, broken dishwasher and got a new Maytag dishwasher. The delivery guys were supposed to hook it up when they got here, but then they discovered that, per their company rules, they couldn't install it because we only had one water shut-off valve for the kitchen sink, not two. Our shut-off valve turns off the water for both the sink and the dishwasher instead of having one for the sink and one for the dishwasher. So I told them to leave it and we'd figure it out. And so we sat with a dishwasher in the middle of our kitchen for the weekend. We've used the same father and son plumbing team for the last several years so we've come to know and trust them. We ended up having them come out to install the dishwasher and we are very happy that we did. 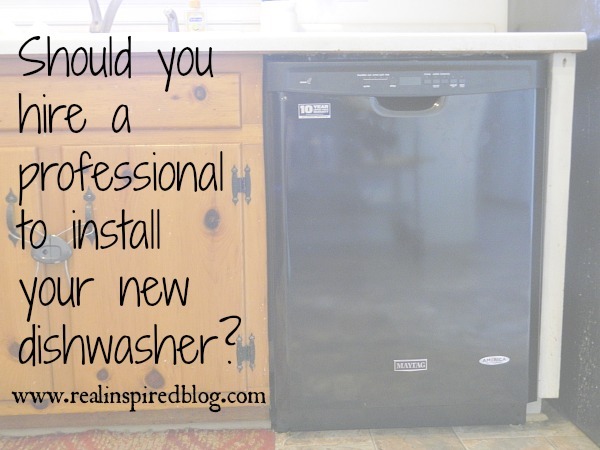 Here are two reasons why I think you should consider hiring a professional plumber for a dishwasher install. 1. Professional plumbers are the experts. 2. The job will be done right. Our plumber told us that they get a lot of calls to fix dishwasher problems within the first couple weeks of them being installed by delivery companies. Many haven't been installed correctly. My brother-in-law also works in the construction business and he says most of their work is going behind someone else and fixing what they did wrong. You really do get what you pay for. Most of the time, taking the extra time and money to get a job done right is the way to go. We were totally going to have the delivery guys install our new dishwasher but I'm very glad that we used our trusty plumber instead! What do you think? Do you have any stories to share of bad work that had to be fixed? Plumbing must be installed properly. Not only an incorrect installation can cause damage to your newly bought dishwasher, but it cans also cause flooding, electricity outage, and unsafe environment. I agree with you, one should hire experienced plumbers to install this correctly.